Happy Tuesday everyone. Today I wanted to update you guys on the progress of the Cabby. There are a ton of you that have been following the progress of this build from day one. I really appreciate that. It has been a long journey over the last year and a half. 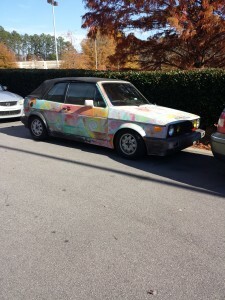 If you are a newer reader, you travel back and check out the cabby before we started the build. Where the project is now. The Cabby is sitting in the garage as I type this. The car ran and drove great. That is until the last time I drove it. I picked the car up from work on Thanksgiving. She made it almost all the way home. I hit the throttle, and started to smell raw fuel. I pulled over to find that the car was pouring fuel on the ground. It looks like a fuel line swelled and started leaking. It should be a simple repair. I am hoping to get that fixed this weekend. What is left to finish? The Vr6 is in and runs really well. It is always stressful rebuilding an engine, then having it sit for 6 months before starting it. So I am happy she runs. There are still a ton of things that need to be finished. The interior is coming along, just a little slow. If you remember, I picked up a 1984 Cabby a few months ago. I used most that that interior in the chalk cabby. I still have to install the rear seats, door panels, and small parts of the dash. It is about a days worth of work. I don’t even know where to start. For now, I think she is going to stay the way she is. What do you guys think? Post up any ideas in the comments. So far, everything seems to work well. I have some lights to hook up. I also plan to control the headlights with relays. This will help to brighten up the lights. I have also considered making the inner lights on the front driving lights instead of high beams. While the engine runs great, there is still a number of things that need to be finished. Some of the wiring harness needs to be trimmed up and wrapped. I also need to have an Oxygen sensor port welded in the exhaust. I also want to change the radiator. I used a 1991 Passat 16v rad. I think I am going to swap it for a VR6 rad. It seems like it will fit better. I am sure there are other things that need to be cleaned up. We will cross that bridge when we get there. To be honest, I have not given a ton of thought here. For me, I need to focus on the next hurdle. It is easy to get overwhelmed looking too far ahead. Once the car is back together, that is where things get interesting. Reliability is my main focus. I want to be able to take a 4 hour road trip and not worry about getting there. I hope by spring it will get there. There are also a few random things I am thinking about. What do you guys think about this? Well, that is pretty much where she sits. I am also working on a guide to some of the things I did with the engine swap, that might be a little different. If you are working on this swap, let me know. I will be more than happy to help if I can. EURO-WISE ~ VR6 install kit, exhaust, front brace(just ordered that) Everyone there is awesome! Black Forest Ind. ~ JOM coil overs. One more thing. I shared this on the Facebook page, but I wanted to post it here. Most of you know that I am a big craft beer fan. There is a new brewery that is opening up in Rural NC. They started a Kickstarter to get the final funding to open the doors. Haw Rives Ales Kickstarter. If you can help them out, that would be awesome. If you do, let me know. I got something extra for you. Just contact me. Very clean looking engine bay. 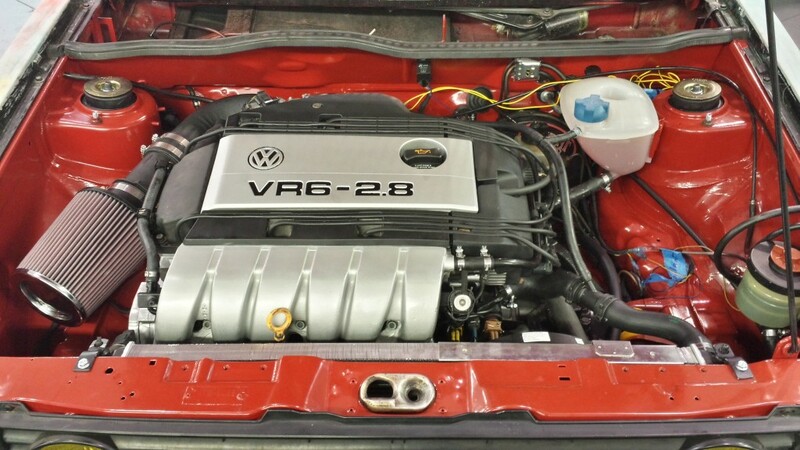 Would the VR6 radiator give better cooling? If so, that could be a worth while swap even if the fit isn’t any better. Have you looked at something like https://www.dipyourcar.com/? Looks like it may be an inexpensive way to get it all one color. love the cab, but haven’t seen a post in a while. still working on it? contemplating on the vr swap for my ’79 which has been collecting dust… outside of the obvious rad, exhaust and suspension augments, did you experience much trouble? wiring? The Cabby was stored up for the winter. With a new born in the house, plus full time at the shop AND doing the show, time is limited. I have not driven it in a few months. Funny enough I was driving to work this morning, missing the car. Not too much trouble with anything really. I don’t have the wiring all finished, the tach is the next big electrical thing to work out. Can you give me some pointers on exactly which pin #’s and connectors I need to keep for the VR6 swap? I left the body wiring alone, and have found the ECM Power and Ground wires. Just not sure what else I need to get her to run!